The 2014 Connecticut General Assembly session will convene at the State Capitol on February 5th. This year is officially the short or ‘budget’ session and runs from February until May 7th. This is also an election year so the Legislators will be out of session earlier to be able to start their campaigning and fundraising. Fundraising is not allowed while the legislature is in session. Only bills concerning budget adjustments are supposed to be proposed during the short session. There still will be many bills proposed that are not just budget related though. Gordon Gibson will again be in Hartford monitoring the General Assembly and watching what bills are presented and which ones we should be concerned about. The State Grange rents a mail box in the Legislative Office Building where we will receive information on bills as they are being presented. 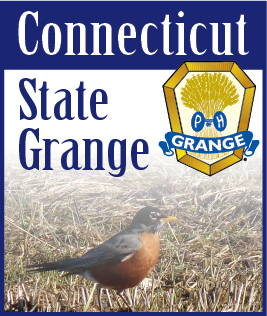 Gordon will be communicating the Connecticut State Granges policies, as directed by your resolutions, which were passed at State Grange sessions to the legislators. Copies of our Legislative Guide Policy Guide will also be distributed to all Legislators early in the session. The Connecticut State Grange may also testify on bills we feel we should either support or oppose as they are presented in the different committees during public hearings. Everyone can also follow the bills being proposed and their action during the legislative session by going to the Connecticut General Assembly web site - http://www.cga.ct.gov/ and sign up for Bill Tracking. You can follow the bills as they are presented to the committee’s and as they travel the process right through to being voted on by the House and Senate and signed by the Governor. I usually follow the bills that are coming out of the Environmental Committee since many of them concern the rural issues that we are usually interested in. There are also many other bills in other committees that we also try to follow as well when we identify them. Any citizen can also testify on a bill in Committee during public hearings if they wish. The General Assembly web site will list the committees and committee members as well as their meeting schedules along with the bills they are working on. It also lists the contact information of all of the Senators and Legislators if you wish to contact any of them to express your support, opposition, or concerns on any of these bills.